Frank Gehry is perhaps the most celebrated practicing architect in the world today. He has been the recipient of dozens of awards recognizing excellence in architecture including the Pritzker Architecture Prize, which honors "significant contributions to humanity and the built environment through the art of architecture." Over the past five decades, under Gehry's creative direction, Gehry Partners, LLP has designed public and private buildings in North America, Europe, and Asia. Hallmarks of Gehry's work include a particular focus on creating spaces that are comfortable to the people who use them, and that exist well within the larger context and culture of their location. The firm's approach to design is one in which the client becomes fully engaged in the process, making each project a true collaboration. Eh,New York, New York! 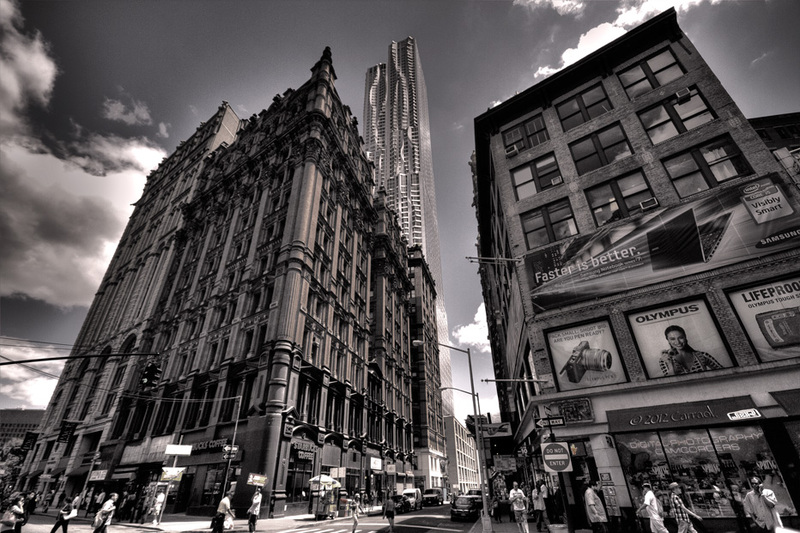 Great buildings and superb photo! Great shot, I like the colors and the pov!